I have given you the keys to My kingdom, says the LORD. USE THEM! They will open up all the storehouses of blessings upon blessings upon blessings that I have held in reserve for you. I AM not holding back on you. All that I have is yours. Now you hold the keys. Now you can unlock the doors. Now you can have anything that you need. NOW! You do not have to plead or beg. I did not make you a beggar and I did not say NO to you. I said, yes. I gave you access to My Kingdom and My power and My glory. You have permission to USE the keys and unlock the doors and receive what you need all the time, says the LORD. I have given you My Name that is above every other name. US IT. Every principality and power is subject to MY infallible NAME. I have given you My WORD. USE IT! Don’t observe it in a passive way, but be a doer of it. RECEIVE the benefits that I have already released for you by your unwavering faith. WHERE IS YOUR FAITH, I ask? Why did you doubt? Are you looking at the storms? They are not only in My control, but yours. I have given you authority to declare, “Peace, be still!” Use what you have and BELIEVE! You are not a wimp and you are not vulnerable to attack. The enemy is defeated by My finished work on the cross. He cannot usurp authority over My shed blood for you. He is not bigger than you, for I Am in the MIDST OF YOU to empower you to be victorious always in ME. 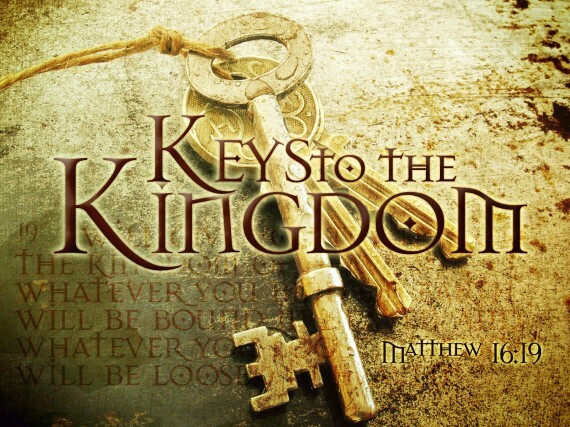 USE THE KEYS, for they will unlock every provision that you need in your life in My kingdom, and you will have My power and glory that I have given onto you forever, says the LORD.